A second-skin finish is the holy grail of foundation application: You want an airbrushed-looking complexion with the luminosity of an Instagram filter, but you also want to look you were genetically blessed with such perfect, poreless skin. And while there's certainly some debate about the superiority of using brushes, beauty sponges, or your fingers to achieve this ideal finish, most makeup artists (and editors) will agree: The Beautyblender (£13) is unrivalled when it comes to finding foundation nirvana. Still, leave it to the ridiculously savvy beauty fans on Reddit to track down a possible competitor from across the globe—and an undeniably quirky one, at that. We won't skirt around the obvious: The "sponge" bears an uncanny resemblance to a breast implant. But while its interesting appearance certainly elevates the novelty factor, does it really make for a superior foundation finish? 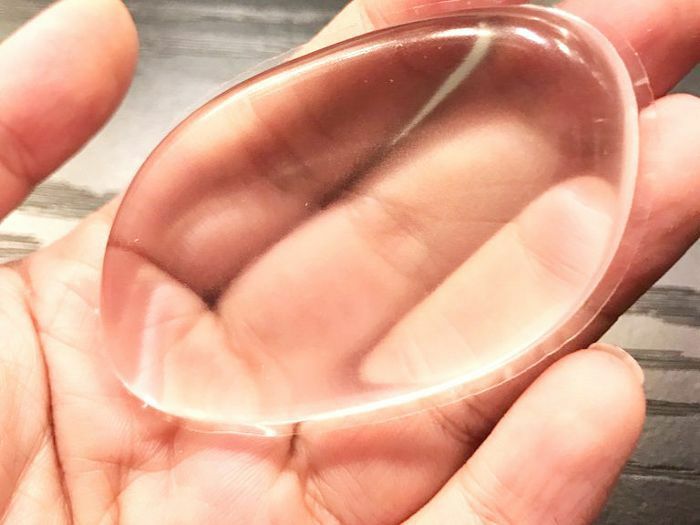 According to the manufacturer, Hong Kong–based Molly Cosmetics, the smooth, nonporous texture means that no precious drop of foundation goes wasted—not to mention that unlike most beauty sponges, it's ridiculously easy to clean. One of the selling points is that it also keeps your fingers product-free, which essentially makes it a glorified makeup spatula. But while convenience is certainly nice, we'll go ahead and argue that it's not worth it if it doesn't deliver on an airbrushed-looking foundation finish. The beauty-obsessed Redditors on /r/MakeupAddiction agree, and they have their doubts. For starters, what is the SiliSponge actually made out of? "Real silicone is almost never crystal clear like that, even in small thicknesses," argues user briannasaurusrex92. "Transparent, perhaps, but it almost always has a bit of cloudiness to it." Hmm. "I honestly feel like this is how it is being slapped in the face with foundation," adds sammisamantha. "Perhaps I take out my gel insert from my fancy bra and apply foundation with that." Next, see what happened when we tested our makeup brushes and sponges for bacteria.